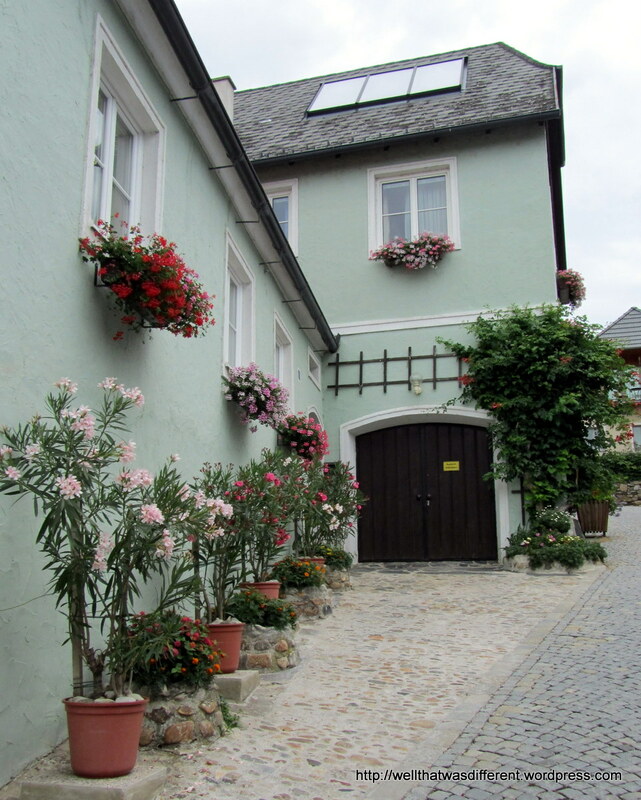 Last weekend, I was escorted by my husband and daughter to the Wachau Valley town of Krems an der Donau for a birthday lunch. 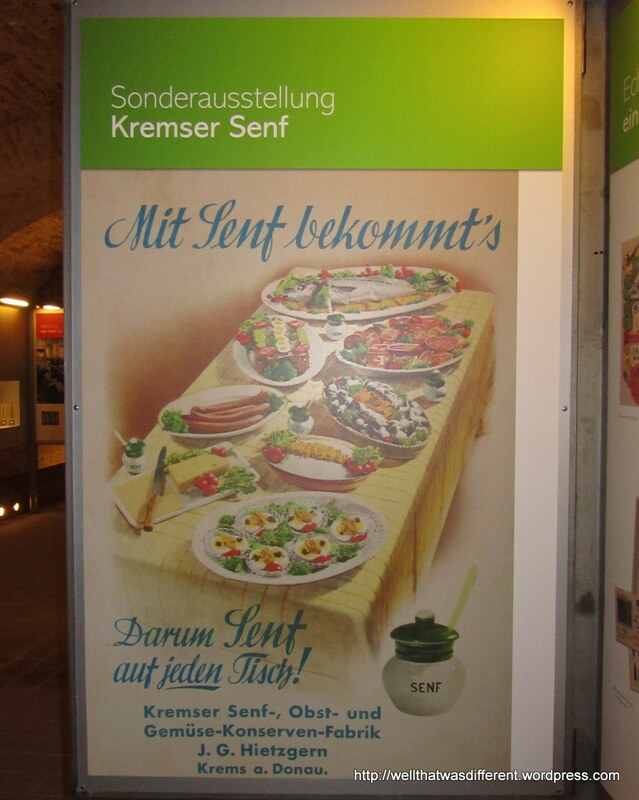 Krems is famous for three things: wine, apricot brandy and mustard. The wine is pretty good.The apricot brandy (schnapps) is unspeakable. The mustard is excellent. 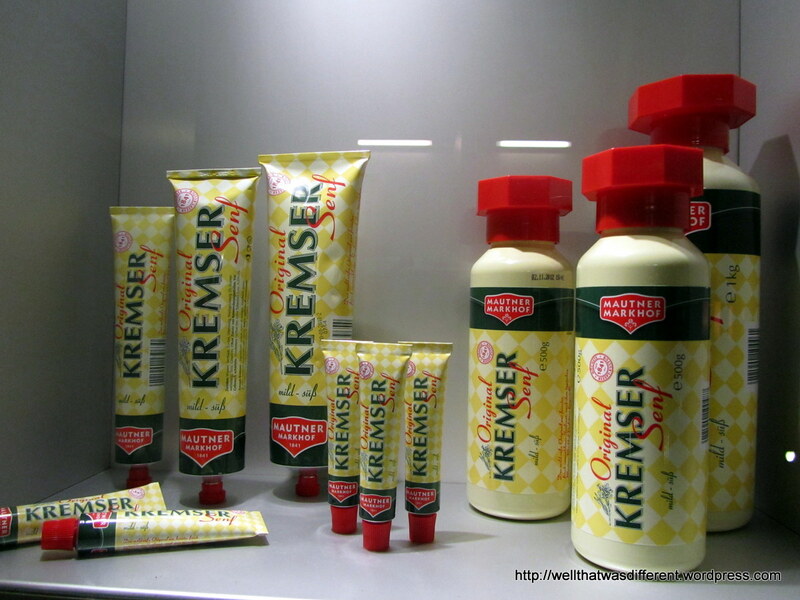 I am not even a big fan of mustard, but I like this Austrian variety much better than the German kind. It’s not as heavy on the horseradish, and even better, is usually found atop some lovely sausages. 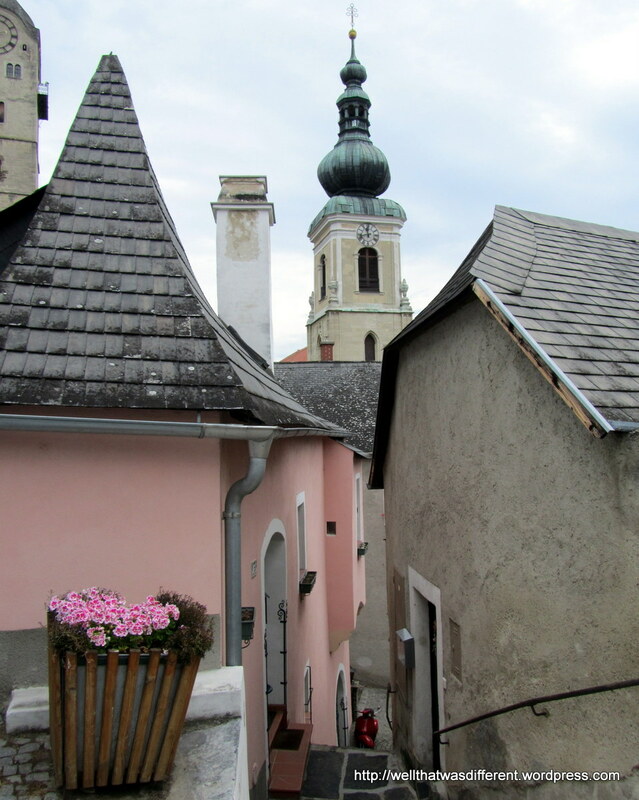 Surrounded by vineyards, Krems is a very old town, dating from even before the Romans. The oldest part climbs straight up a hillside, with all kinds of twisty little streets and interesting houses that often extend back into the rock face. There is a medieval museum I would like to see that was unfortunately closed that day. 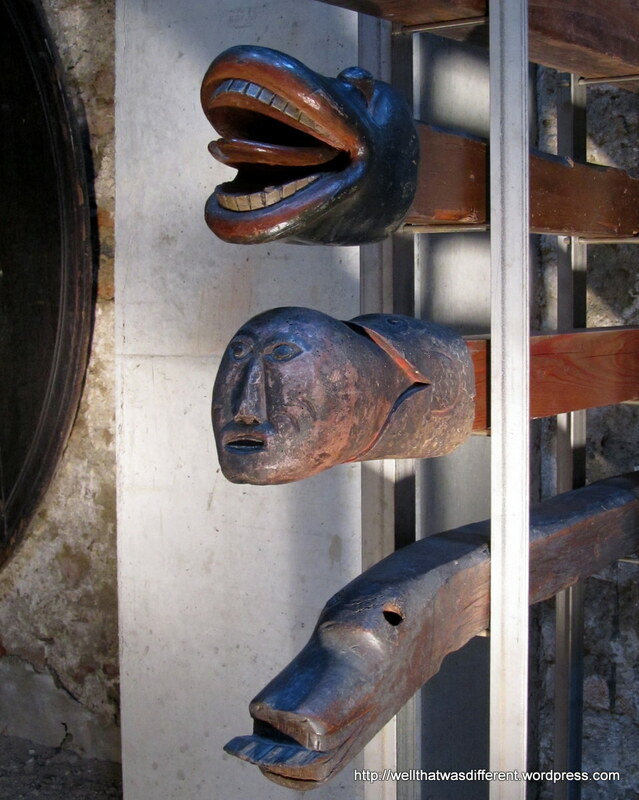 But the city museum was open, so of course we had to see that. 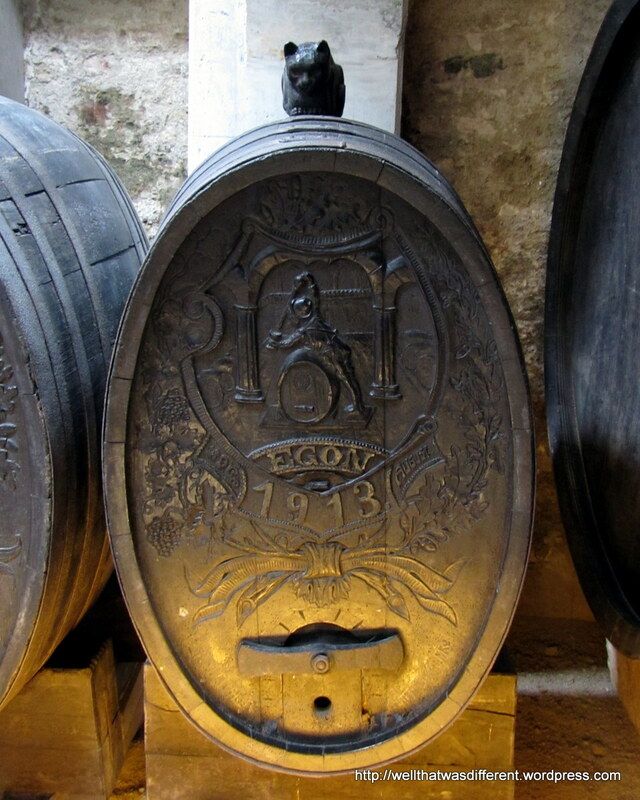 This one is located in an old Dominican monastery, with exhibits occupying just a small portion of the extensive wine cellars underneath. Pretty cool. 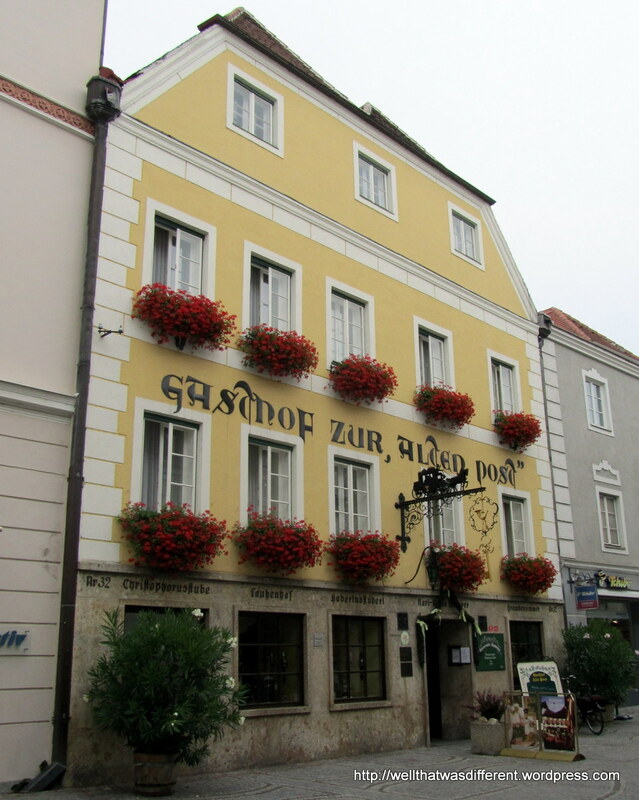 We had an excellent lunch at Zur Alten Post, which is an old coaching inn. 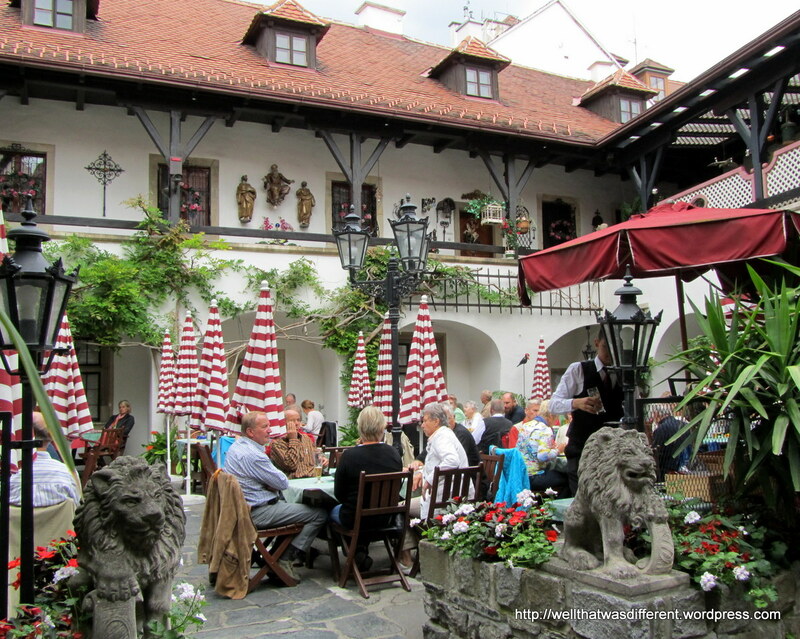 It’s a little touristy, but seemed to be mostly occupied by Austrians on a day out from Vienna. Maybe they were the only tourists willing to eat outside on a cloudy 65 degree July day. Besides us, of course. We know better than to wait around for nice weather by now! 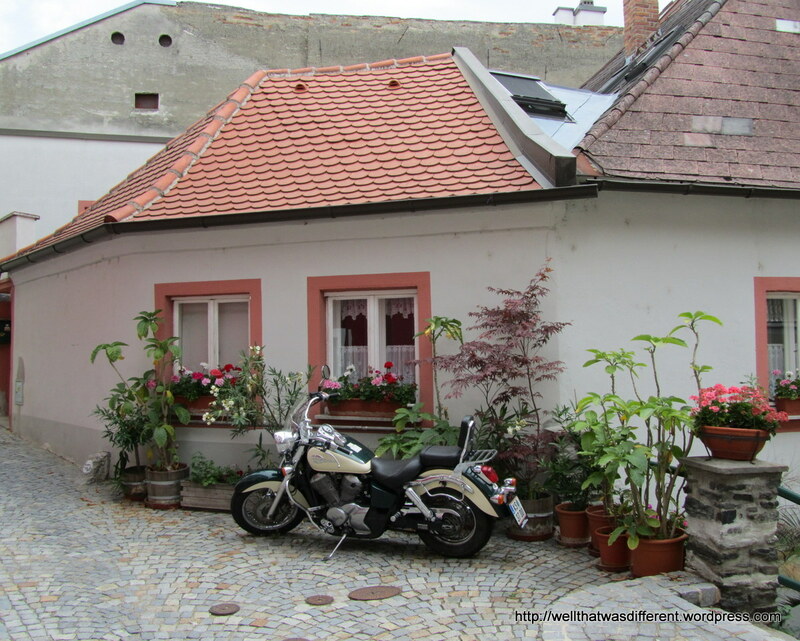 If I lived here, I’d want a motorcycle for these little twisty streets, too. 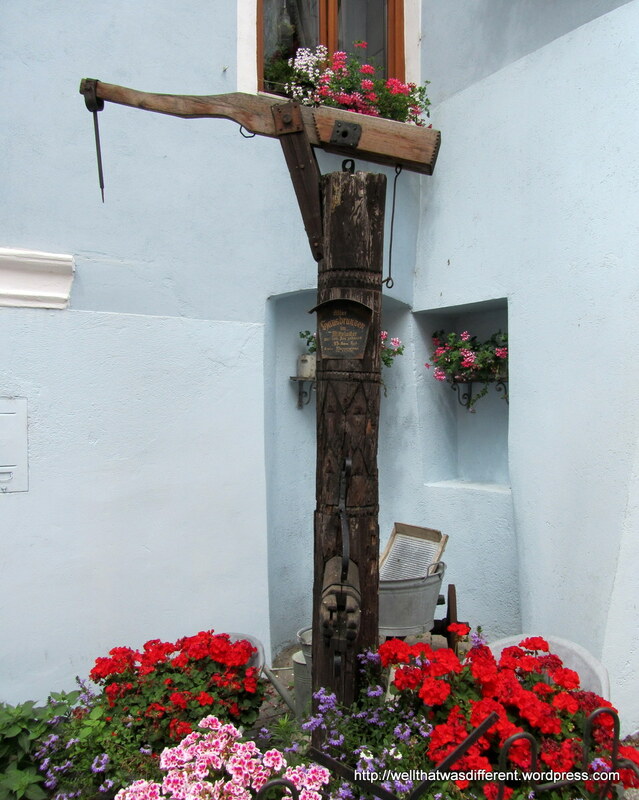 And old town well. 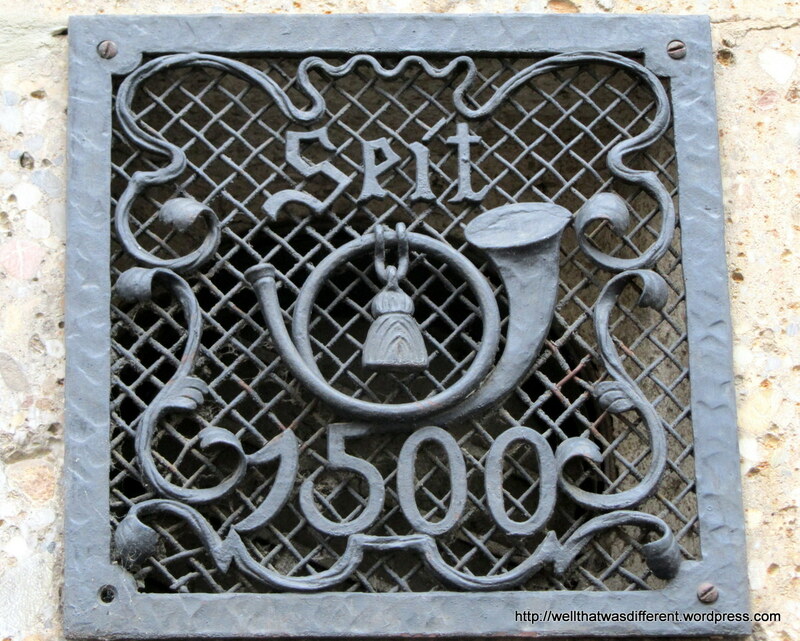 I believe the sign says it dates from 1380. Grapes growing pretty much everywhere you can get grapes to grow. 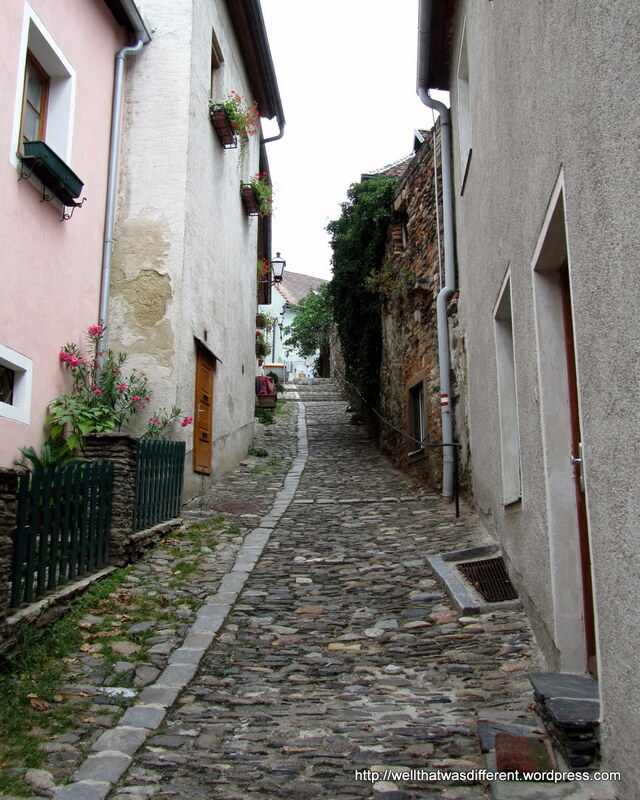 Many of the streets are just narrow steps. 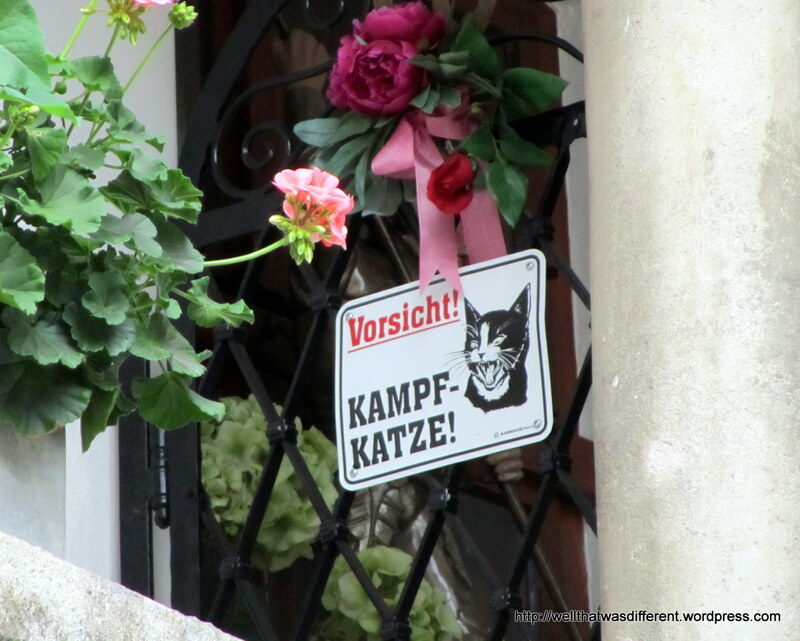 The inscription over the door is very common in Central Europe. 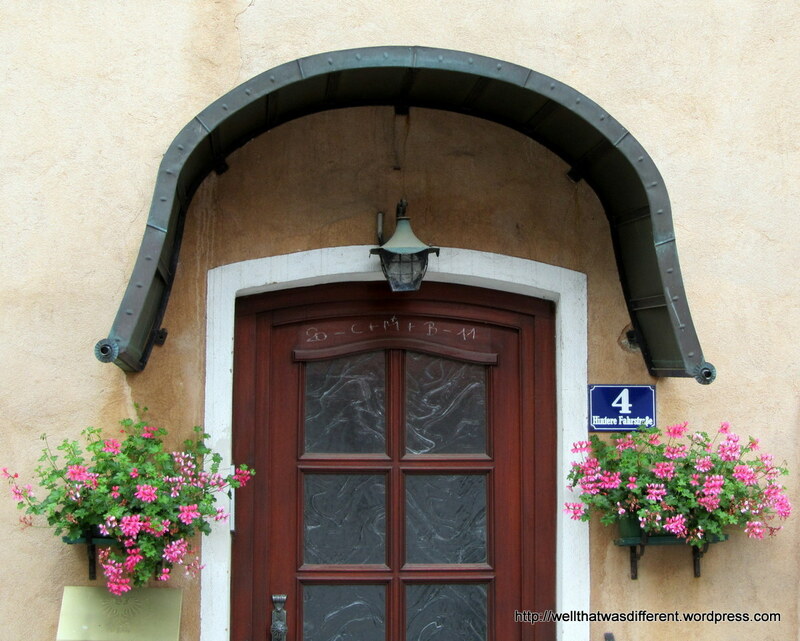 It can either stand for the initials of the Three Wise Men or “Christus mansionem benedicat.” (May Christ bless the house) depending on who you ask. The numbers on either end refer to the date: this house was blessed in 2011. 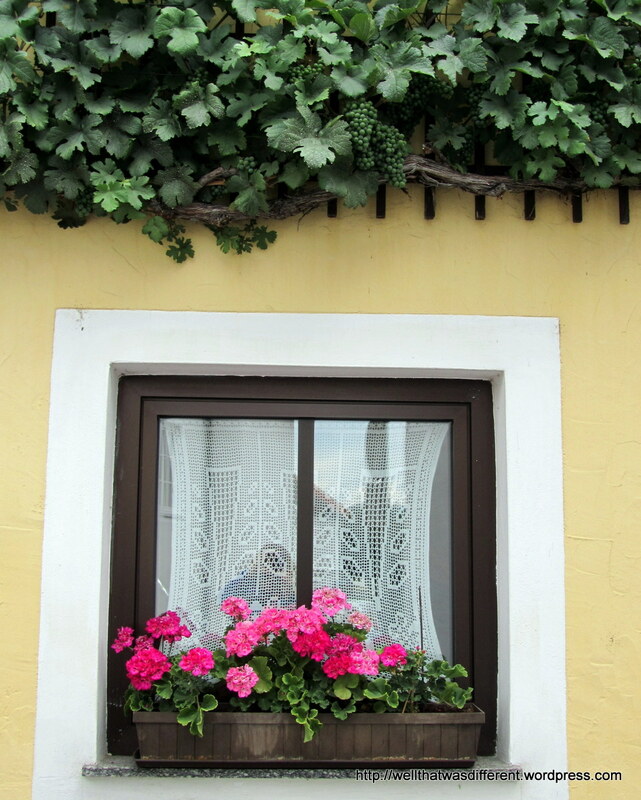 Nice way to have a front garden. 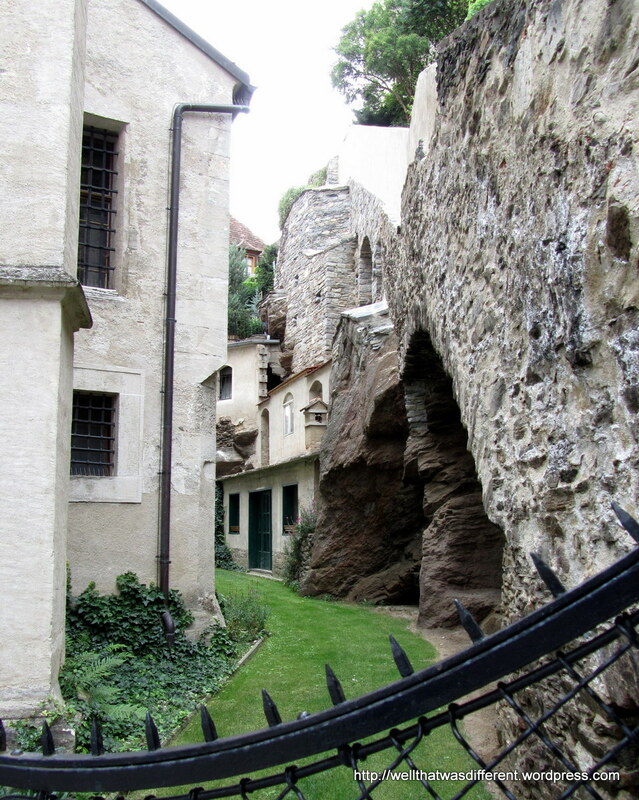 Behind the main church, on what probably used to be a street, there are several houses or cellars built into the hillside. 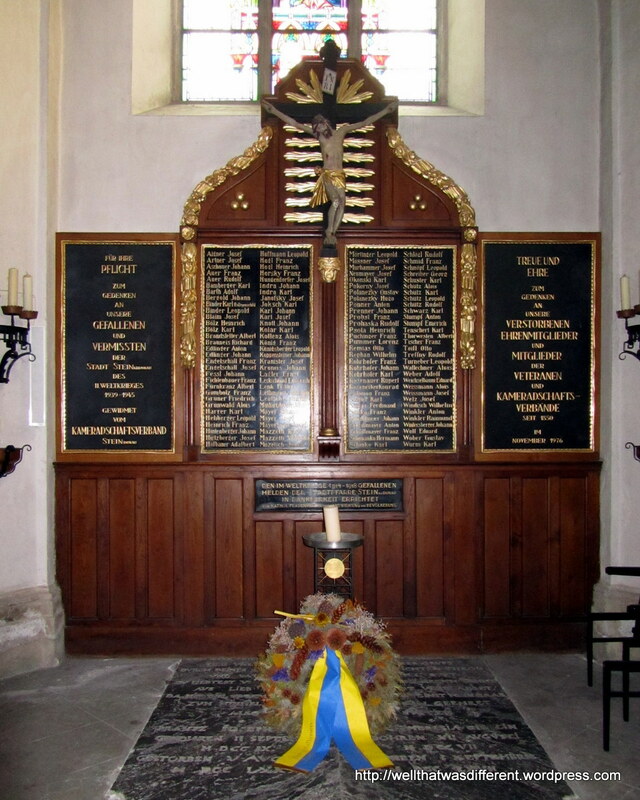 Memorial to WWII dead in the church. 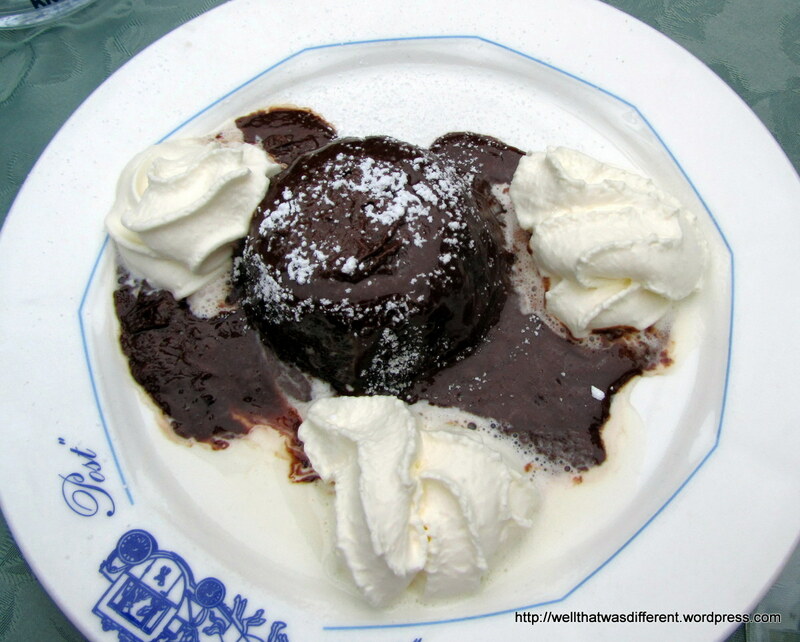 Traditional Austrian dessert, Mohr in Hemd or “Moor in a Shirt.” Some people are annoyed by the name, which is admittedly not very PC. It is, however, delicious. Chocolate hazelnut Bundt cake with chocolate sauce and whipped cream on top. 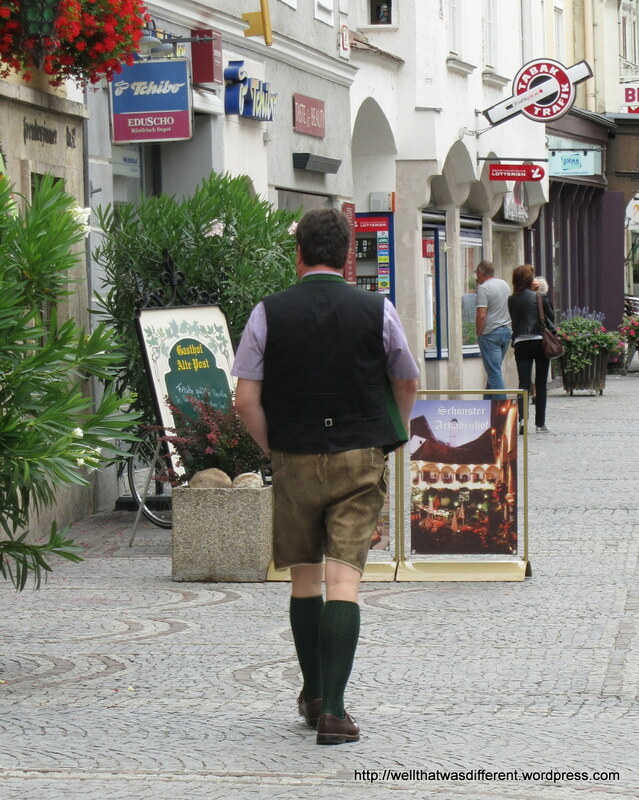 Yes, you do actually see some men wearing lederhosen in Austrian towns, especially on Sunday. 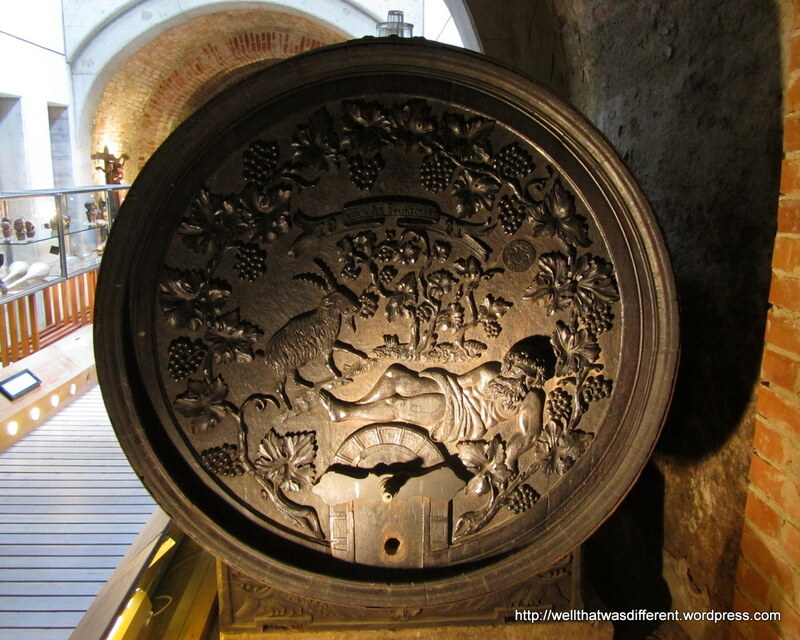 In the city museum: beautifully carved wine barrels. 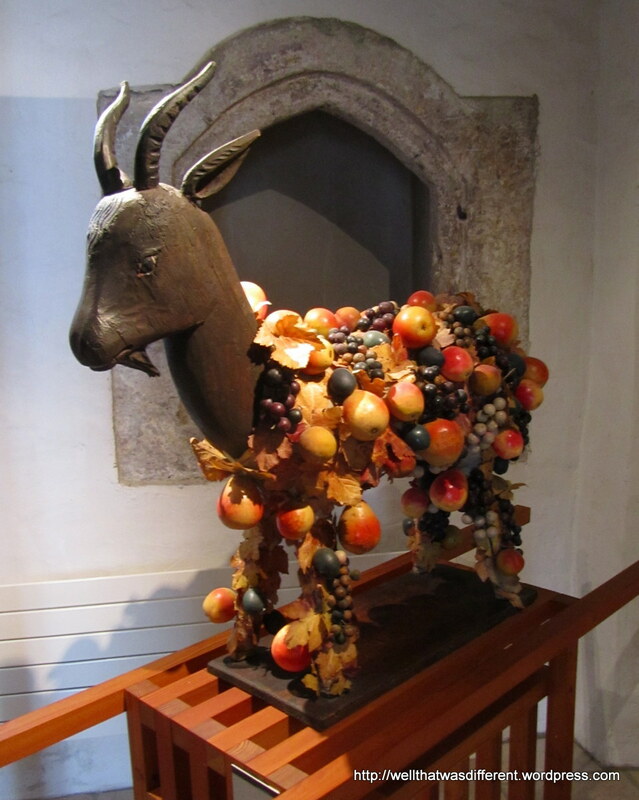 A wine donkey. That’s what the sign said. I have no idea what a wine donkey is or does. A wine barrel guarded by a little cat. 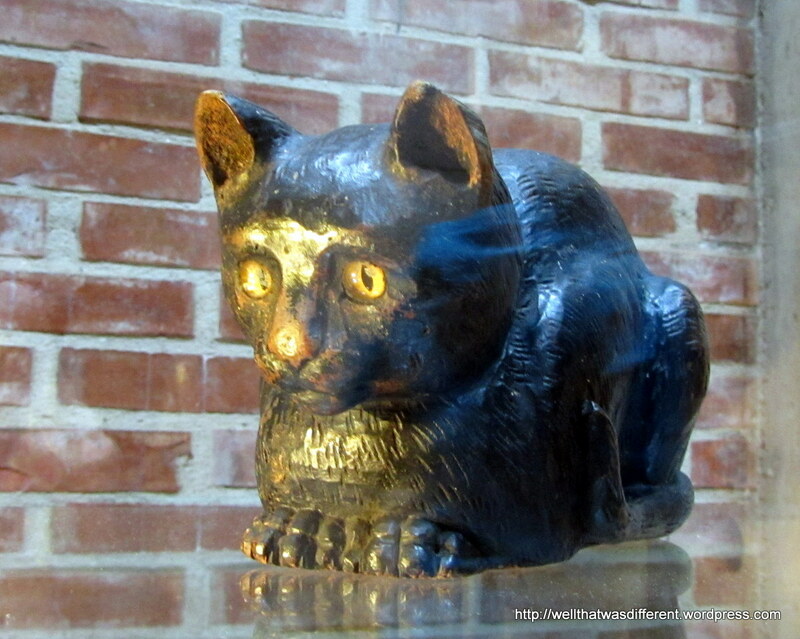 Another carved cat. Where can I buy one? Want! 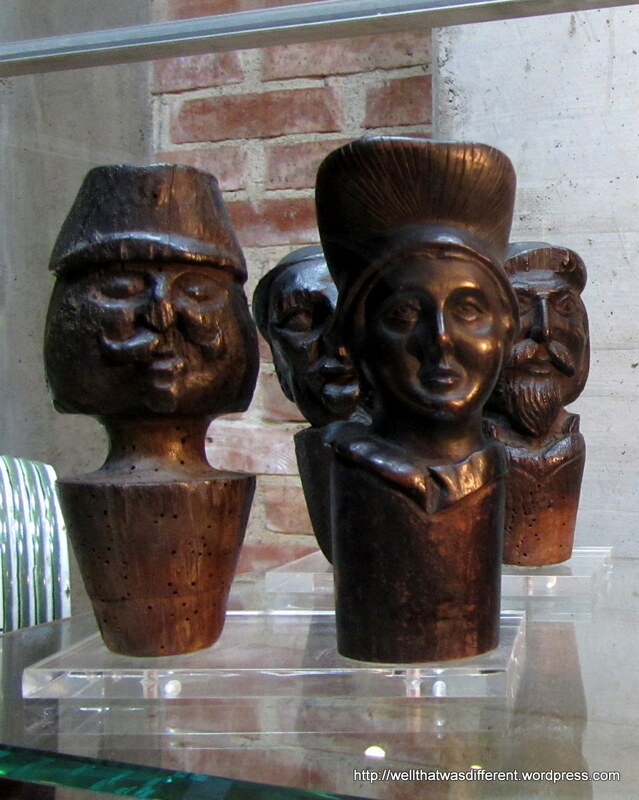 Hand carved wine barrel stoppers. 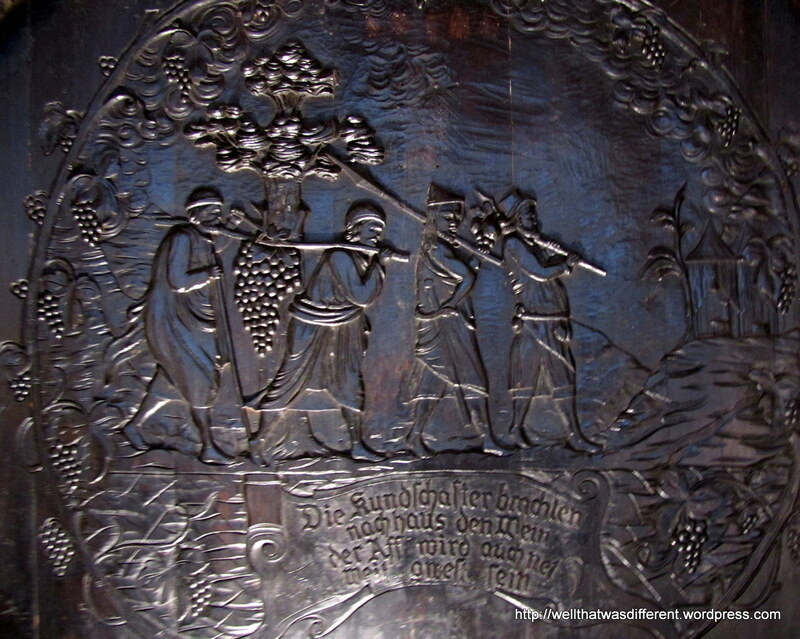 We finally figured out that these are traditionally decorated cross pieces for a big wine press. 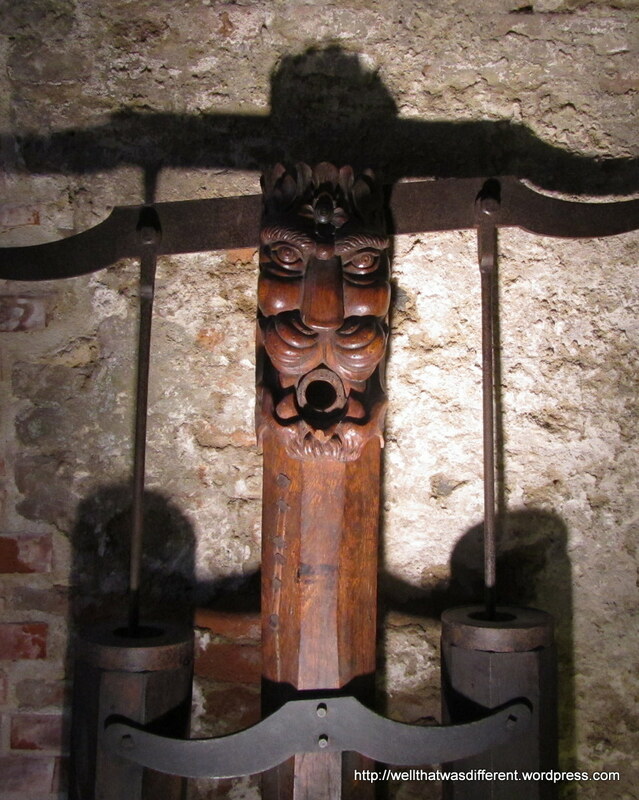 Some kind of wine press in the slightly spooky cellars. 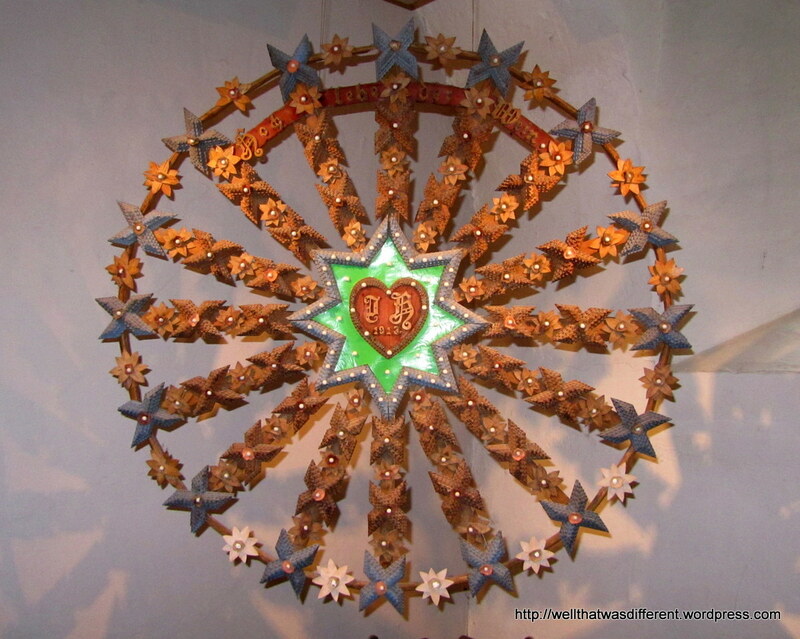 An elaborate hex sign–yes, just like in Pennsylvania Dutch country. The mustard section of the museum. 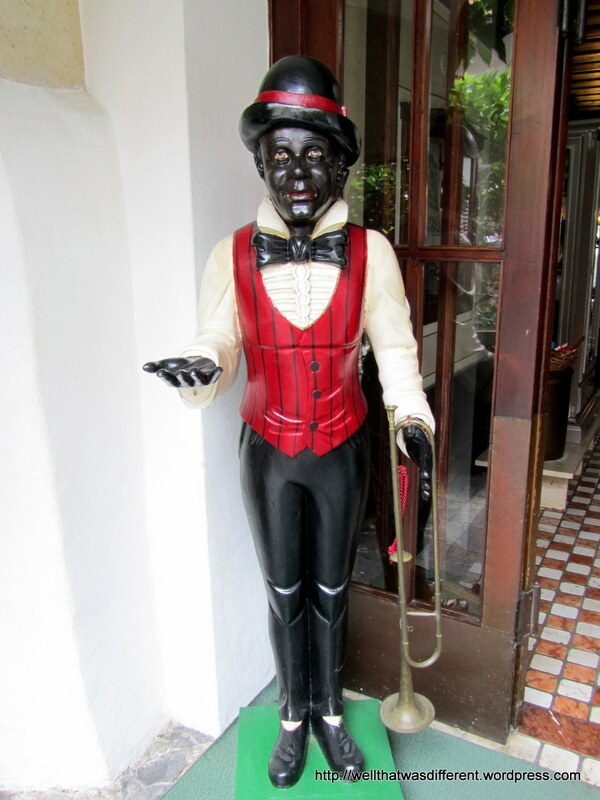 Great report on a beautiful town. Thanks.